There is not a performance car more popular from the 1970s era than the 1970-1981 Trans Am or as many today refer to it as the second generation Trans Am. It began the decade in 1970 as a low production 2+2 performance car and ended the decade as its most beloved performance car. When the EPA stepped in and tried to spoil the party with stringent mandates and regulations which spelled the end to most large-displacement performance engines. Pontiac didn’t flinch, it just kept churning out its Trans Am with large displacement performance oriented V8 engines. Sales of the Trans Am continued to skyrocket. When the 1970s decade began Pontiac produced 3,196 Trans Ams for the 1970 model year. When the 1970s decade came to a close, for the 1979 model year, production had shot up to 116,535 units. A total of 374,233 Trans Ams were produced during the 1970s decade. If you include the last 2 model years of the second generation Trans Am, 1980 and 1981, 458,462 second generation Trans Ams were produced. That’s almost a half of million Trans Ams. The Trans Am began the 1970s decade with a Pontiac 400 cubic inch V8 as standard equipment for 1970. In 1979 the Trans Am had as an option, a Pontiac 400 V8. The Pontiac 400 would be the engine that would provide power to most Trans Ams during the 1970s. A Pontiac 455 cubic inch V8 was available in the Trans Am from 1971-1976. The only reason Pontiac dropped the 455 V8 option was because GM canceled its production at the end of the 1976 model year. GM did the same to the Pontiac 400 V8 during the 1978 model year. Pontiac was smart enough to save a large stash of 1978 RPO code W72 400 V8s for the 1979 Trans Am and Firebird Formula. A total of 8,326 1979 Trans Ams would be equipped with the 220 horsepower W72 400 V8. Pontiac underrated its true output, NHRA rated this motor in stock form at 260 horsepower. Back in 1979, no other American car could touch its performance. Though performance was decimated in most American cars as the 1970s progressed, the Trans Am did alright. Back in 1970, Hot Rod Magazine tested a 1970 Trans Am equipped with the Ram Air IV 400 V8 and obtained a quarter mile time of 13.9 seconds at 102 mph. In 1979, Hot Rod Magazine tested a W72 400 V8 equipped 1979 Trans Am and obtained a quarter mile time of 14.6 seconds at 96.67 mph. This performance time would have been very respectable in the original golden era of the muscle car, in 1979 it was down right outstanding. Even when Pontiac starting in 1977 couldn’t use the Pontiac 400 in the California market due to California Air Resources Board (CARB) regulations, it used Oldsmobile’s small-block 403 cubic inch V8. 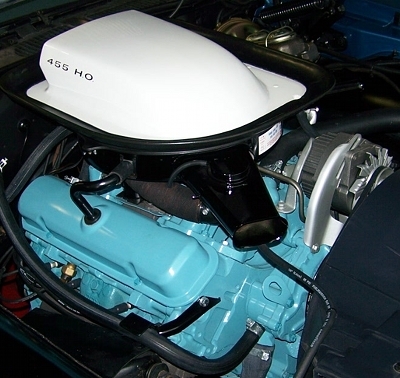 The 403 V8 would later become the 1979 Trans Am’s standard engine. For 1979, the W72 400 V8 was optional along with the Pontiac 301 cubic inch V8 which was an engine delete option. The 301 would become the Trans Am’s standard V8 for 1980 and 1981, it was available in a few variations including an optional turbo configuration. Chevrolet’s small-block 5.0 liter (305 cubic inch) V8 would be a Trans Am engine option for 1980 and 1981. In case your not convinced that the Trans Am was the only large cubic inch V8 game in town during most of the 1970s, just remember Ford cancelled the large displacement V8 option in the Mustang after the 1971 model year. Chevrolet pulled the plug on the Camaro’s large-displacement V8 at the end of the 1972 model year, for the Corvette it was the end of the 1974 model year. Chrysler dropped it’s large-displacement V8s in its Plymouth Barracuda and Dodge Challenger at the end of the 1972 model year. Not only did the Trans Am reign by having the must cubic inches in its class during the 1970s, ironically during this era it had the best performance motors Pontiac ever produced under its hood. Theses engines were the 1969-1970 Ram Air III 400 V8, 1969-1970 Ram Air IV 400 V8, 1971-1972 455 HO V8, and 1973-1974 455 Super Duty V8. Starting in 1970 and going all the way through the 1981 model year the Trans Am had wild wheel flare spoilers in all four corners. They gave the Trans Am a much more muscular appearance over the other Firebird models and just about any other car of its era. There was a stylish front chin spoiler which connected to the lower area of the front wheel flares, this gave the Trans Am a racer look. Did the fender flares improve aerodynamics? Who really knows or cares. They just looked awesome, and that was the point. Chevrolet seeing a good thing started slapping wheel flares on its Camaro Z28 starting in the 1979 model year. One of the items on a second generation Trans Am that usually intrigues most onlookers are the front fender air extractors, one per front quarter panel. These are large vents that reside on all second generation Trans Ams, they add to its very sporty look. However they weren’t originally intended to add to the Trans Am’s looks, they are really functional. If you ever had the opportunity to stand next to one when a Trans Am’s engine is at normal operating temperature you’ll quickly realize warm air is escaping these vents. These air extractors were originally designed to keep temperatures down in the engine bay. It’s a job these air extractors do very well. 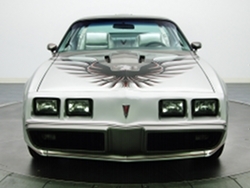 How can you talk about a second generation Trans Am without mentioning the massive full length hood bird decal? Who in their right mind came up with this wild idea? It was Bill Porter, styling chief at Pontiac during its golden era. Porter got the idea from Norm James who was the designer of the 1959 Firebird III GM concept car. James added a much smaller bird to the Firebird III’s hood. 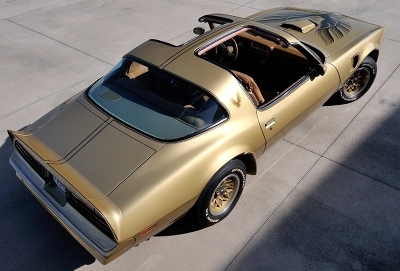 Porter wanted to debut a much larger and more refined version of James hood bird on the 1970 Trans Am. Bill Mitchell who at the time was in charge of all styling at GM, would have no part in this non-sense and he overrode Porter’s wishes. John Schinella who replaced Porter a few years later, forged ahead with Porter’s hood bird idea, eventually convincing Mitchell it was worthy of production. The compromise that was reached was the big hood bird decal would be a Trans Am option and not standard. 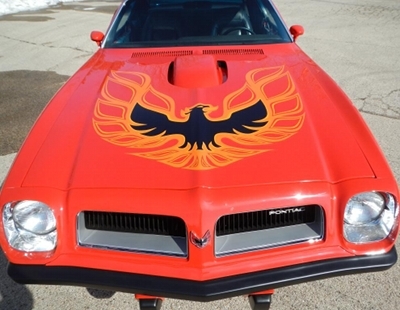 So from 1973 to 1981, the big hood bird decal was a Trans Am option buyers would have to pay extra for. It proved to be so popular that today finding a Trans Am from these years without one is like finding a needle in a haystack. Fortunately this story had a happy ending, the second generation Trans Am wouldn’t be the same without it’s big hood bird. It’s an icon from the 1970s that proved to the world the Trans Am was a bold and unique muscle car. Spoilers had been used in rare cases by automakers on production cars before the second generation Trans Am, however they were wing style spoilers that looked like they were slapped on as afterthoughts rather than part of the car. With the introduction of the 1970 Trans Am that all changed, the world saw a new ducktail spoiler that was form fitted around the rear body panels. It started a craze which continues today, at the present there are many new cars with smooth form fitting rear spoilers. Every second generation Trans Am was equipped with a ducktail spoiler. The design was so good, Pontiac kept the same overall design during the entire 12 year production run. There are two slight variations of the second generation Trans Am ducktail spoiler. One was was used on the 1970-1978 Trans Am. The other which had improved aerodynamics, was found exclusively on the 1979-1981 Trans Am. All second generation Trans Ams had an aluminum engine turned dash bezel. The bezel was a large aluminum trim piece that covered the whole entire gauge cluster area of the dash. Most Trans Am engine turned bezels were the aluminum color however in a few special edition Trans Am models the bezels were gold. If the exterior had not convinced interior occupants they were in a muscle car, the engine turned dash bezel would give them the undeniable proof they were. Ironically this dash design aged very well. It still looked modern even during it’s final year of production in 1981. The Trans Am’s engine turned dash bezel design puts to shame most modern car dashboard designs. By the 1970s automakers began hiding exhaust pipes. The shiny chrome exhaust pipes that were available on many 1960s muscle cars had all but disappeared. The 1970-1974 Trans Am had dual exhaust pipes which were visible but they didn’t quite match the Trans Am’s character. Starting in 1975 that all changed. 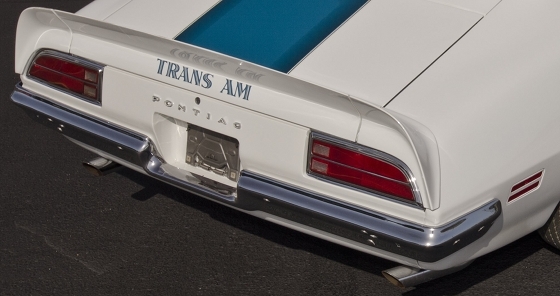 Pontiac revived the 1964-1965 GTO’s dual exhaust tip design for the Trans Am. These chrome exhaust tips gave the Trans Am a truly muscle car look with a chrome splitter exhaust tips below the rear quarter panels behind each rear wheel. The end result was another unique touch which added to the Trans Ams fantastic exterior design. Chrome splitter exhaust tips would be standard on all 1975-1981 Trans Ams except for the 1980-1981 Trans Am powered by Chevrolet’s small-block 5.0 liter V8. These rare cars used the 1980-1981 Camaro Z28’s dual outlet exhaust system. 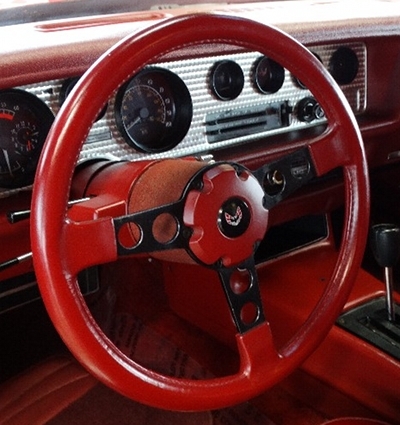 Pontiac released it’s now famous formula steering wheel for the 1969 model year as an option on some of its muscle cars. It was a smaller diameter wheel with thick padding, it fit a driver’s hands like a glove. It was the closest thing you were going to find to a race car steering wheel during its era. It was such a good design it was found in every single Trans Am from 1970 to 1981. Even if you remove from the second generation Trans Am all the exterior items previously mentioned, the styling is still very elegant but very bold. These Trans Ams all have a long flat hood, extremely short decklid area, curved door panels, curvy fenders, and a semi-fastback roofline. Its a lot of different design elements that when bunched together is a classic work of art. Add to that a low and wide stance and you have one macho looking car. There’s no doubt that the second generation Trans Am was the best Trans Am design every produced, and perhaps may even be the best styling to ever grace a muscle car. I bet you thought I was going to forget to mention the item which was first introduced as an option on the 1976 Trans Am 50th Anniversary Special Edition, the T-Top removable roof panels. T-Tops debuted on the 1968 Corvette. It took almost a decade later to become a Trans Am option. The first Trans Am T-Tops were made by Hurst, they were quickly replaced by GM’s made in house Fisher Body Division T-Tops. By the 1978 model year T-Tops were a very popular option and remained so until the Trans Am finally ended production in 2002, by this time they were a standard Trans Am feature. In an era when convertibles had been phased out, the buying public liked the idea of removable roof panels that gave the car the feel of a convertible when removed, and when not the feel and safety of a hardtop coupe. The Trans Am T-Tops were smoked glass so they gave the normally large roof area a nice contrast. Not to mention they gave interior occupants a see-through roof which allowed daylight to shine through to brighten up the interior cabin. However this was a double-edged sword, on those hot sunny summer days if the T-Tops were left on, the interior would really bake like a greenhouse if you didn’t have air-conditioning. In closing, when just about every automaker gave up on the performance car in the 1970s, Pontiac made it’s boldest and most macho car. The second generation Trans Am is a favorite among collectors and muscle car fans. Even the most harshest of critics upon viewing a Trans Am in person will admit there’s something special about this car. Pontiac may be long gone but the second generation Tran Am lives on. With so many still on the road and in car collections today, it’s safe to say the love affair will continue for many generations to come. Long live the second generation Trans Am!